Anna Schmidt has journeyed into the uncanny, and what she finds there is a nightmare world of cold, impersonal “justice.” A plethora of policemen ramble around Anna’s apartment—even Anna’s unkempt, Cat Lady-esque landlord makes sure to point out that, while the Austrian police are nowhere to be found (is there even such a thing? ), American, British, and Russian officers make themselves at home, rifling through Anna’s drawers, tossing about her personal belongings, committing an almost Kafkaesque breach of privacy. 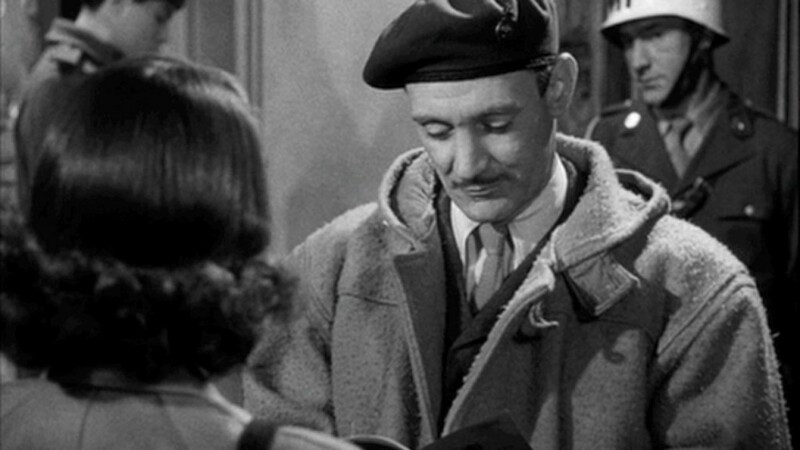 (In this scene at least, the policemen with whom Anna pleads—including good old Major Calloway—are as evasive and cryptic as the hellish bureaucrats that detain Josef K in The Trial, a work that has already connected with The Third Man in a roundabout way.) Why does Sergeant Paine have a stack of intimate love letters written between Anna and Harry Lime? Why do Calloway and Paine smile twistedly while poring over Anna’s identification papers? (The snide, gloating smirk Calloway gives Anna when he asks, reading off of her passport, “Your parents were born in Graz, Austria?,” is positively withering.) All these officers can do (for the time being) is offer a receipt for the belongings they’ve confiscated and tactlessly revel in Harry’s death, all while Anna looks on, barely containing the pain and tears. These officers are in Anna’s apartment because of Harry Lime, although we’re still not aware of the crimes that Harry has committed and how they could be ruthless enough to warrant such relentless investigation. Holly and Anna still fight for his honor: Holly (predictably) admonishes Calloway, claiming that he’s too busy to have figured out that Harry was murdered, while Anna admits that the only disreputable thing Harry ever did was a small favor for a friend. (That “small favor” happens to be her suspicious passport, which Calloway holds in his hands.) Will Anna be proven wrong? Will the heartless tactics of the police be vindicated, unfortunate means to a justified end? One of The Third Man‘s recurring themes is conflicting modes of justice—not only Holly’s cowboy vigilantism (which he considers nobly stalwart, even though the movie itself pokes fun at it) as opposed to Calloway’s callous, calculated policing, but also the apocalyptic “justice” of world wars and of soldiers who believe they are killing for a righteous cause. Given these unfavorable modes of law and order being practiced, one might very well assume that societies’ ostensible guardians of well-being and morality are not really much better than those they try to persecute. The movie’s depiction of flawed vehicles of justice becomes tempered later on, as the police’s vigorous investigation of Harry Lime turns out to be mostly justified. In today’s frame, though, we have a nerve-wracking snapshot of a frighteningly impersonal police system, what with Calloway’s condescending half-smirk as he detects the forgery of Anna’s passport, not to mention the MP in the upper-right-hand corner of the frame, needlessly casting Anna a distrustful glower. The Third Man is one of the best (and most exciting) explorations of the shifting, elusive shapes of justice that I can think of; another is John Ford’s The Man Who Shot Liberty Valance, made 13 years later (in 1962). That film focuses on the antagonism between Ranse Stoddard (James Stewart), a brilliant lawyer from the East who journeys by stagecoach to the small Western town of Shinbone to start a law practice; and Tom Doniphon (John Wayne), a local rancher who resembles one of the gung-ho cowboys we might see in a Holly Martins paperback. 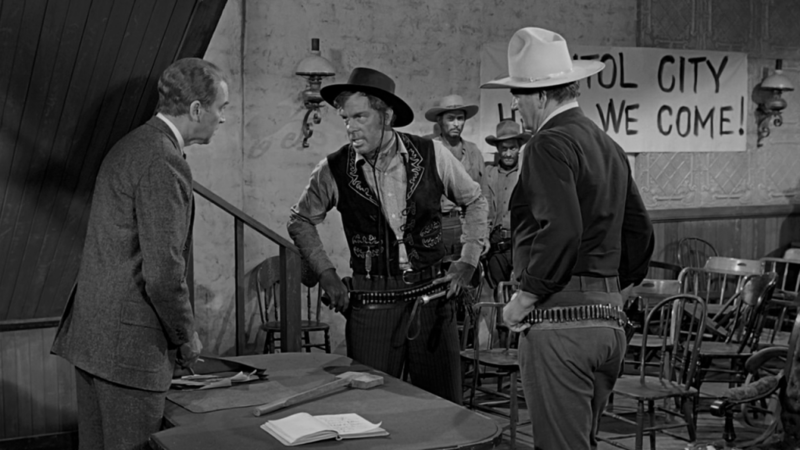 The town of Shinbone is being torn apart by a bandit named Liberty Valance (Lee Marvin) and his unruly posse; to protect the town and put an end to Valance’s reign of terror, Stoddard advocates justice under the law (the arrest of Liberty Valance and a fair court trial) while Doniphon advocates justice under man (renegade justice that would likely end in Valance’s murder). Even the casting of the film—sophisticated, composed Jimmy Stewart versus the reckless, brawny Duke himself—points towards its exploration of contrasting forms of law and order. It’s a small leap, but for our purposes we might equate Holly Martins to Wayne’s Tom Doniphon and Major Calloway to Stewart’s Ranse Stoddard: manifestations of frontier and civilized justice, respectively. The Searchers (1956) and The Man Who Shot Liberty Valance are typically seen as Ford’s best pictures, or at least his most thematically complex, because they refute the simpler, more black-and-white portrayals of law and order, justice and criminality, that he espoused in earlier films (especially Rio Grande from 1950). Maybe The Searchers and The Man Who Shot Liberty Valance act as Ford’s self-rebuttals, deeper explorations of familiar territory. In any case, both The Third Man and The Man Who Shot Liberty Valance question which kind of justice is more effective, not to mention which is more ethically defensible. In Ford’s film, Stoddard and Doniphon eventually compromise on a myth, a complete fabrication, that both of them conclude is more socially beneficial than what actually happened: when the lie becomes a tool for maintaining civil law and order, the truth becomes somewhat moot. In The Third Man, Holly Martins’ assumptions regarding the no-nonsense efficacy of renegade justice versus the bureaucratic machine of the police, the military, etc., will also become subverted. He eventually discovers that who initially seem to be heroes and villains may in fact be quite the opposite, and finds it increasingly difficult to lie to himself in order to reaffirm his preconceived (and somewhat naive) notions. What does this have to do with The Third Man? I think it’s interesting to ponder which wavelength this film belongs on: a more Fordian sentimentality or a dark Wellesian cynicism. Or is The Third Man precisely about the inability to reconcile these two contradistinctive worldviews? Holly Martins storms into Vienna like a John Ford vigilante, thinking he can better the world by upholding justice and honor and defending the legacy of his fondly-remembered friend. But he soon comes face-to-face with the realization that morality is not absolute, that memories can distort and obscure, that relationships can come apart at the seams, that the world can become bitter and dark almost without one noticing it. True, The Third Man is lively, humorous, and deeply emotional, but it corresponds closely to the cynicism and existential darkness displayed by Welles in Citizen Kane, The Stranger (1946), The Trial (1962), and Touch of Evil (1958). Certainly in The Third Man, Welles’ character provides a great deal of thematic complexity and wry despair. As a director, Carol Reed seems perfectly inclined to fuse the populist sentiment of Ford with the unsettling ambiguity of Welles, making The Third Man as entertaining as it is profoundly disquieting.